The exploration of culture through landscape, art and food. My artwork The Museum of Urban Design is fulfilling its destiny. Nothing like making art and having it become more relevant than previously anticipated. As Mayor Bloomburg sets a mandatory evacuation out for Zone A in New York, in preparation for hurricane Irene. I am somewhat glad that I had to move from Red Hook, Brooklyn to Windsor Terrace, Brooklyn, even if it was during the huge New York blizzard earlier this year. Last October bringing with its torrential hail and rain disasters, two different floods to the same flat, in the same month, two weeks apart made it evident that I would have to move even though the museum’s creation was is full swing. This event, coupled with the landlords sudden insistence that he did not want what looked like a farm in the backyard, spurred the move. I was secretly happy that he, upon pausing and gesticulating said the word farm. The artwork that I started there called the Museum of Urban Design that moved with me, all 10,000 plus pounds of it, mostly of soil weight, addresses issues of aesthetics and use in the urban landscape among other things. 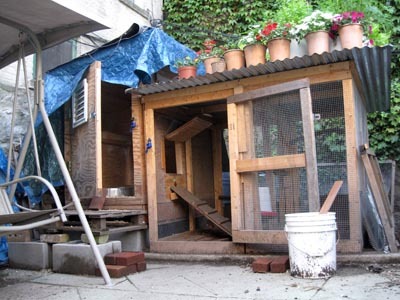 A central feature is CVES (Chicken Coop/ Vitrine/ Emergency Shelter) a sculpture that is designed so that one can, in case of power outage or need of alternative shelter, be able to sleep comfortably in the coop in the winter or in the run during the summer. CVES is designed and built to be flat packed, portable and is multifaceted in nature. The Museum is made up of repurposed materials from local businesses in Red Hook that would otherwise have gone into landfill. I carried the materials by foot, by bus and occasionally by rented vehicle to create a completely portable, bio dynamic vegetable garden with chickens. So frequent was my foraging for materials to create this artwork, that a boy on a bike in the neighborhood last august said in shock, “You aren’t carrying anything!” as he passed by. The museum should fair well during hurricane Irene and in the aftermath. Large pickle barrels are being used as grey water storage containers for sanitary needs and the plethora of cleaned restaurant sized pickle and oil buckets have stocks of clean water in them. A vegetable garden provides sustenance. The chickens provide eggs daily, which are safe to eat raw as the chickens are well kept and their diet is organic and varied. CVES can be used if the apartment is damaged and there are all manner of tools to use to fix anything minor that needs to be attended to. CVES was built with less than 10 tools. It’s amazing what you can build with a screwdriver, drill, jigsaw and clamps. CVES Mark I, the first home for my hand raised flock of heritage chickens, is ironically being stored in Red Hook and even more ironic, is the fact that the unit it is situated in, is above one of the storm drains in the building, blocking access to it. It was too large to move through the house into the yard here at the new location, so CVES Mark II was created from scratch in three days under duress during Christmas Eve, which is a much smaller more portable version. Yes, I was building a manger at midnight in the freezing cold. I am also feeling quite secure here in Windsor Terrace as the World Police and Fire Games are being held in Prospect Park a few blocks away. Hoping for the best for everyone in this storm and may you all stay safe.